Smart Start Consulting is the best all in one resource for estheticians, nail techs and other service industry professionals to grow their business! Why should we put spa & salon sanitation disinfection and sterilization at the top of our continuing education? Public health and safety is the top priority of our job and is fundamentally the largest aspect of our work. Anyone who has basic training can provide a service, or apply a set of acrylic or gel nails but if you are using unclean implements or practices those services can cause an infection or worse death. It is our obligation to educate our clients so they know that we have the highest standards when it comes to the cleanliness of our work. To do that we must educate ourselves and the clients to follow the standards when it comes to sanitation disinfection and sterilization. 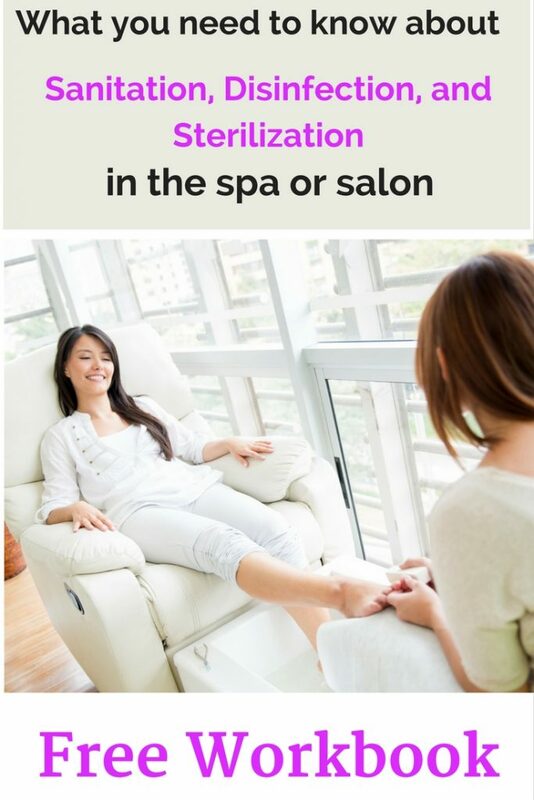 EST 1 Esthetician – All Trades Sanitation, Disinfection, and Sterilization is a work-study booklet that is the most current and up to date study guide on sanitation, disinfection, and sterilization for estheticians. This invaluable resource is available in our Free Esthetics Traning Manuals. The Saskatchewan Apprenticeship and Trade Certification Commission (SATCC), Damaris Terleski, Nove Salon & Esthetics Wholesale Ltd, and Veronica Lynne-Swirsky have co-authored a fantastic study resource. This guide is perfect for newbies, or experienced estheticians who want a refresher or to nail down the correct practices. The guide is composed of objectives, hands-on practices, theory and much more. It’s printable so you could print off a copy for each of your staff and have them work on it as a take home project. Please share this guide with your colleagues. If you are interested in other free training manuals take a look at Free Esthetics Traning Manuals. Special shout out to Savana Glazier for help on this article.